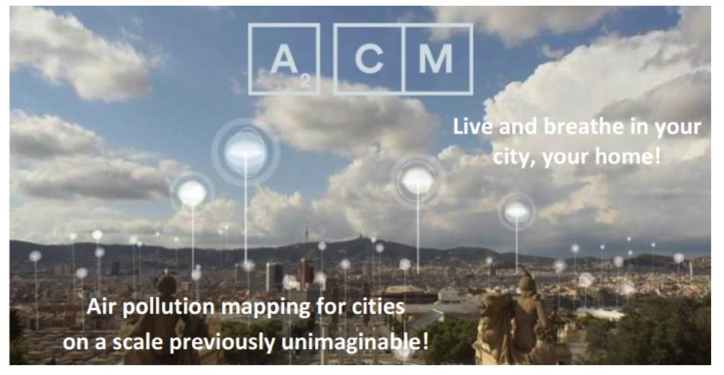 Ateknea Solutions Europe has been granted an SME Instrument Phase-1 grant in the February 2017 cut-off date for the A2CM project, Deploying the novel, large-scale Ateknea Air City Monitoring Platform. The core of this Technology has been developed by Ateknea under the European project citi-sense.eu where low-cost gas sensors were implemented with high accuracy due to a novel post-process algorithm applied over raw data provided by sensors. The installation of A2CM nodes placed in streetlights within a dense matrix will permit achieving the high spatial and temporal resolution required to define a solid plan for air quality enhancement and consequently mitigate air pollution in cities. We want to commercialise a very powerful, innovative and unique urban air monitoring system that will permit, for the first time, to really map air pollution in cities on a previously unimaginable scale. Air pollution is a major problem for public health, and it is only expected to get worse due to urbanization on a global scale. Air pollution in cities is linked to up to 1 million premature deaths and 1 million pre-native deaths each year. Urban air pollution is estimated to cost approximately 2% of GDP in developed countries and 5% in developing countries. The overall goal of the proposed project is to bring to market this comprehensive and fast pollution-mapping tool for cities.